I have so many organic carrots in my fridge that I just had to do something with some of them. 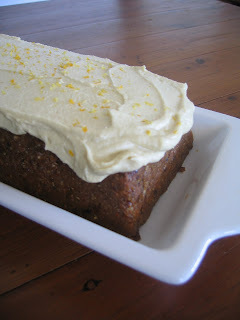 So after making a big batch of crackers I rinsed out my new favourite toy.. My blixer and whizzed up a yummy carrot cake.. This is the first time i've done a raw carrot cake and I was really impressed with how it came out. It's really quite delicious! It seems the longer it sits in the fridge the better it get. chop carrot into chunks and place into a food processor, process until finely ground but not mushy. Add dates and blend until fairly smooth. Add remaining ingredients and blend until all ingredients resemble the size of course bread crumbs. Then place the mix into a cling wrap line baking tin or container of your choice. It does not have to be a baking dish, you can also use any other storage container, be adventurous, round, square, oblong.. the choice is yours or you may form it up free hand onto a plate. Place into the fridge to cool completely before frosting. Rinse and drain cashews then place all ingredients into a blender and blend until smooth and creamy. Place into the fridge to cool and thicken then spread onto cake. Sprinkle zest over cake to decorate and enhance flavour.